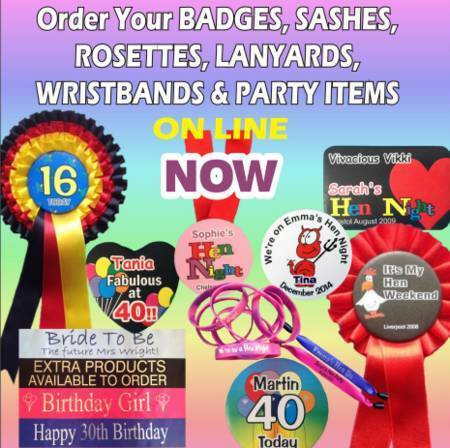 Our customised wristbands make the ideal accessory for your party. Whether it is a hen night, stag night, a birthday celebration or just a general get-together to celebrate something special. It helps to identify you as belonging to a special group, enjoying a special time together. The customised wristbands are also ideal for schools so that individual pupils can be identified as belonging to a school group. We can add school contact details or a mobile number to the wristband. This can be very useful in case one of the younger pupils becomes separated from the main group. With our ribbon wristbands, we can offer a quick delivery. Because we don't need to produce expensive and time-consuming foil blocks, we can literally produce just one wristband, with no additional charges. This m akes our personalised wristbands the ideal choice when you have a small group of people. This is also useful if you want to add individual messages or contact details to each of the personalised wristbands. For larger numbers of guests, and here we are talking about more than 25. Then we can supply the more traditional personalised wristbands that are made from silicone. We can supply these in a range of styles and colours and with your choice of colours for the text. This style of wristband takes a little longer to produce. So you really need to allow about 10-15 days from the date of order before you will receive the wristbands. If you want the wristbands for younger people then we also have junior sized wristbands that can be produced. Or, if you require a mixture of adult and junior wristbands then each size would have a minimum order quantity. If yo u need any advice or want to talk to us before you place the order, then please give us a call. We would be delighted to hear from you.